There is a wonderful tool in Edgenuity that has a pre-created assignment calendar to help keep you on track. This calendar is very useful; however, please note that these are the minimum requirements per day, and while this calendar does take into account Bridgeway holidays, it does not take into account other days you may take off between now and your deadline. Watch the video below for information about accessing the Assignment Calendar in Edgenuity. The date of your final day of school. You can find this in the Bridgeway Learning Center or you can set your own if you have a different goal. Follow the steps below to create your calendar. Determine the number of days you plan to work to meet your deadline. Count the days you plan to work, excluding holidays and other days you will not be working. Log in to Edgenuity and click on the Organizer in the top-right corner. 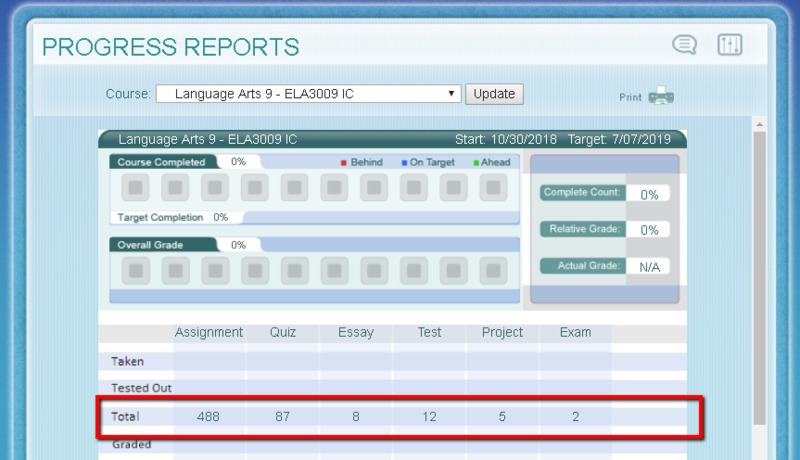 Click on Reports and then select Progress Report. Determine the total number of activities in a course by adding all of the activities in the Total row. Divide the total number of items from above by the total number of days you will be working. This is the total number of activities you will need to complete each day to meet your deadline. In the example above, there are 602 total activities. If our example student wants to complete this course in 250 days, then the student must complete 2.5 assignments per day. Since it is not recommended to complete a partial assignment, this student could complete 2 assignments on one day and 3 on the next. It is recommended that you complete the quiz on the same day that you completed the instruction and the summary lessons. You will need to repeat these steps for each course.